Channel 2's Ehud Yaari says Mursi not seeking war but will demand Israel let Egypt deploy more military forces in Sinai. Egypt's new president, Mohammed Mursi, will turn the "cold peace" with Israel into a "hostile peace," predicts Channel 2 News's veteran Arab affairs expert, Ehud Yaari. When Anwar Sadat was president, Mursi established "The Egyptian Society for Fighting Zionism," Yaari writes in an article on Channel 2 News's website. "He devoted his whole adult life to serving the Muslim Brotherhood, out of a deep belief in the idea – the renewal of the Muslim state. His opinion has not changed, although he will now strive for a partnership with secular parties…"
The Muslim Brotherhood, writes Yaari, has always possessed a great amount of patience. "Step by step, he will try to stabilize a monopoly on power. Not hurriedly, not through confrontations, but through a gradual building of force, just as Khomeini did in Iran." 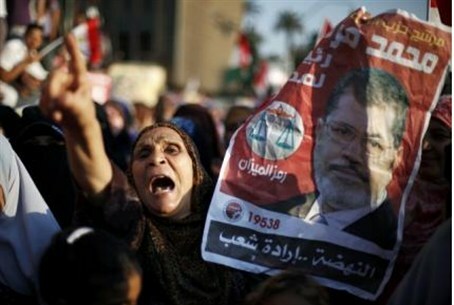 Mursi is not looking for war with Israel, and he will let the military manage relations with Israel, thinks Yaari. "But it is nearly certain that, at a moment not too far off from now, he will insist that Israel 'reassess' the 1979 peace treaty and demand that the military protocol limiting the Egyptian army's deployment in Sinai be amended.